KINAMU CTI with Promptar SugarCRM, Inc.
Computer Telephony Integration with Sugar Promptar is a business application targeting organizations willing to increase their teams’ productivity. Integrating business processes and applications with the existing phone system, Promptar collects and delivers the right pieces of information to any user participating in a phone call, increasing productivity by reducing task execution time, minimizing human errors and speeding up decision making. 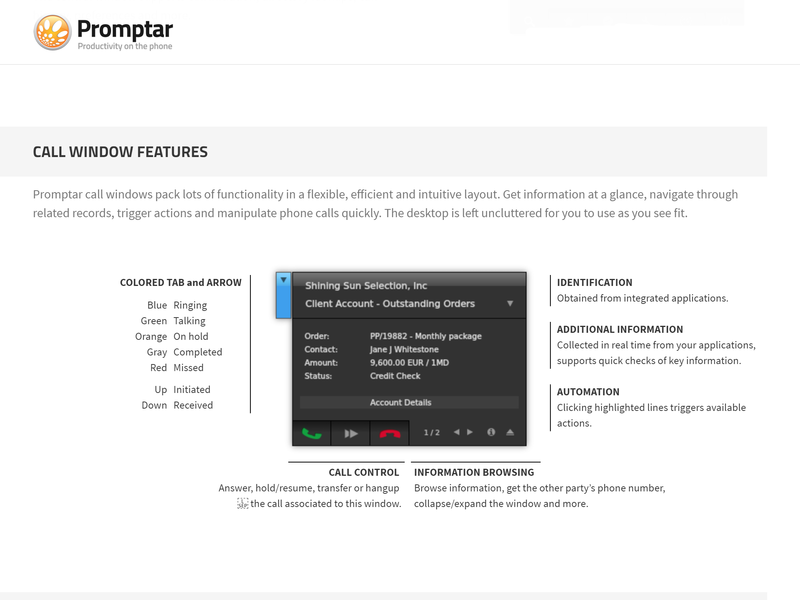 Promptar is comprised of a central server that integrates with existing phone systems and applications via multiple connectors, running on Windows or Linux. Users run the client on Windows or Mac laptops and desktops while at the same time, all phone based activity can be fed to your analytics platform. Match calls with records in your application. Find related ones. Templates collect, combine and filter application fields. Rules define when one or more templates should be used. Different data for different teams? No problem. Dependent on application data? Sure. Multiple language support? Of course. Initiate phone calls in a snap. System wide click-to-call support from your browser, mail client and other apps. Quick paste-and-dial, always within reach. Lookup for contacts in your applications and call them. And more. Simplify call handling with a complete and convenient view over all the calls on your phone — whether ringing, talking, waiting or on hold. Transfer, hold, resume, answer or hang up any call from the desktop. With a single click. Associate one or more actions with each template. Open URLs, prepare emails for sending or run external programs and scripts. Include application data if needed and have them triggered manually, by the user, or automatically. Runs on Windows or Linux. Collect any combination of fields from your applications into an unlimited number of templates. Display one or more templates per call based on configurable business rules. Support multiple applications simultaneously. Associate multiple customizable actions to each template: built-in or create your own. Actions can be user-triggered or automatic. Support for multiple matches per call, with simple data navigation for the end user. Lookup for contacts throughout any combination of applications, on a per user group basis. Store call detail records (CDRs) with associated business information in a database for later analysis. Runs on Windows or Mac. Non-obtrusive user interface with an amazing design. Easily deployable throughout the organization. Multiple call support: full information about waiting callers. Transfer calls at the click of a button. Copy the caller phone number and paste it anywhere. Click to call from web browsers and other applications. Quick, always-available access to contact lookup for easy call initiation. Paste to call: grab a phone number from anywhere and quickly initiate a call. Call history tracking, including missed calls while offline and quick call back initiation. Multiple display support. The huge variety of providers, manufacturers and equipment turn phone system integration into a key challenge. Technology based connectors for AMI, CSTA, HTTP and TAPI support, among others: Alcatel, Asterisk, Avaya, Broadworks, Cisco, Mitel, Panasonic, Polycom, Siemens, Snom, Switchvox, Yeastar,.. Automation of over the phone tasks that are part of business processes, increasing the organizational productivity. Delivery of the right information from Sugar to the right person in any telephone-based communication context, maximizing the efficiency and value of this communication. Each persons sees detailed caller information the contacts name &amp; details, the company and many more. 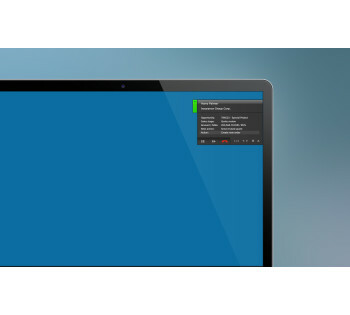 It is even possible to configure the information that is shown in the Caller windows. Your employees can simply click on the KINAMU CTI Promptar window and change into easly to Sugar records or create new ones (e.g. Cases, Calls, Meetings). Keep track of all call related activity. Store full call details in an external database and answer questions like: how much time are we on the phone? Inbound or outbound? How many rings does it take to answer our client calls? How much time are they put on hold? Relate calls with context information and data from your applications.